A quick little painting of lovebirds that I did for my husband for our 2nd anniversary yesterday. Available as a print at Society6. Yesterday I finished another new watercolor illustration. This is a personal piece titled ‘Submerged.’ Prints of the piece can be found here and the original painting is also for sale in my shop. I may be rearranging my Etsy shop or starting a Big Cartel shop for all of my original paintings very soon. I’ll stop gushing about watercolor in every post now, I promise. But I do love it! This week I finished my first real illustration with watercolors. It was commissioned by Tofugu.com for the banner of a new site they will be launching soon – WaniKani.com. Below is a scan of the full painting – which is also for sale (if you’re interested shoot me an email). The half-crab half-alligator creature was envisioned by the client and they specifically requested a kaiju-style monster battle. Beyond that, I was given free reign to have fun – which I did. Below is a larger, cropped image which is how it will appear on the site. I’ll try to grab a screenshot when it goes live. You can see some process images of the illustration in my previous blog post. It is also available as a print here. If you like this style and you’re interested in a commission, get in touch! 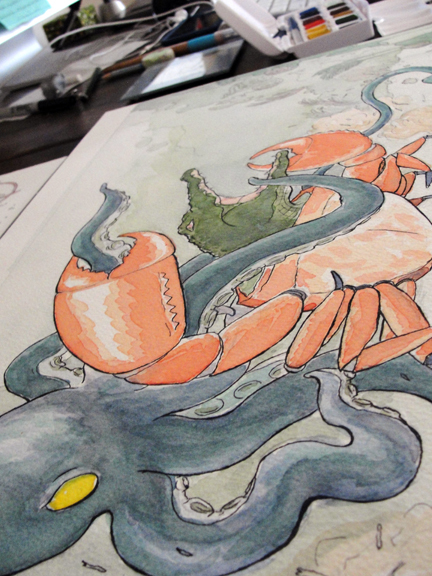 This is a work-in-progress for a client and it’s my first completely watercolor and ink illustration. Yesterday I was painting for about 5 hours and it flew by. It’s been a long time since I’ve had so much fun coloring an illustration. It might be time to invest in a decent set of paints and watercolor brushes. More watercolor painting experiments for me over the weekend. After getting a recommendation, I bought this carbon ink to replace my India ink. 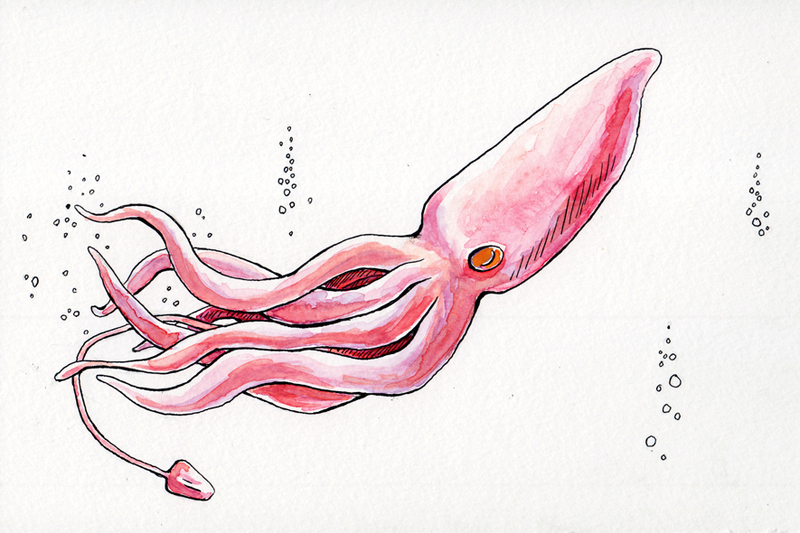 I sketched up this little squid (or big squid, since there’s nothing to compare it to) to try out the ink and to keep practicing with the watercolors. I’m still using some cheap watercolor paper, but I have some nicer paper that I will use when I start creating full illustrations this way. The ink is great, by the way. It dried much faster than my India ink and didn’t bleed when I added the watercolors – regardless of how much water I used. It also flowed smoothly from my nib without clogging it up. It’s been a long time since I’ve physically painted on paper and I forgot how much fun it is. It’s also nice to have something physical to show for the work. I always thought watercolors would be far too difficult for me – in reality it looks like I may be going in this direction in a more permanent way. The slightly unpredictable textures and effects I get with the paints are so much more interesting and natural for me than those I used in Photoshop. I am not formally listing any of these paintings for sale, but if you’ve seen something that you are interested in purchasing, get in touch. Naturally, I am also available for commission if you’d like me to create something just for you! On an unrelated note my husband, Christopher Kondrich, is a poet and writer whose first book will be published by Parlor Press in the fall. He has started a website/blog where you can read some of his work and get updates on the book and his readings. If you like poetry, I hope you’ll check it out!